This article is about an American sports broadcaster. For a Canadian politician, see Joseph Tait. For an English footballer, see Joe Tait (footballer). Joseph "Joe" Tait (born May 15, 1937) is a retired American sports broadcaster, who called the radio play by play for the Cleveland Cavaliers of the NBA and both TV and radio for the Cleveland Indians of Major League Baseball. With the exception of two seasons in the early 1980s and illness in 2010-11, he was the Cavaliers' radio announcer from the team's inception in 1970 through the 2010-11 season. He won the Basketball Hall of Fame 2010 Curt Gowdy Media Award. Tait was born in Evanston, Illinois. He attended Monmouth College in western Illinois, where he began his radio career. He did various jobs, including play-by-play on a local radio station in Monmouth (WRAM), sports reports, and operations manager. He graduated in 1959. After college, Tait spent three years in the United States Army Security Agency. After the Army, Tait bounced around, spending time in Decatur, Illinois. From 1966 to 1968 he was the official voice of the Ohio Bobcats, served as sports director for WOUB, and taught sportscasting at the Athens institution. He next served as the network voice of Indiana University football, and was the pre-game host for the Indiana Pacers in 1969. In 1970, Tait began his longtime association with the Cleveland Cavaliers, who were in their first year of existence. The games were broadcast on WERE for the first two years. After then-owner Nick Mileti, who also owned the Cleveland Indians, bought Cleveland's most powerful radio station, WWWE (now WTAM) in 1972, he moved both teams' radio broadcasts to WWWE. Tait was the radio announcer for the Indians from 1973 through 1979 along with Herb Score, and their TV announcer with a variety of partners from 1980 through 1987. However, prior to the 1980-1981 season, new controversial Cavs' team owner Ted Stepien had a disagreement with WWWE. Consequently, the station gave the broadcasting rights back to Stepien. Yet, many Cleveland fans mistakenly believe that Tait was fired by Stepien. In the interim, Tait was the radio announcer for the New Jersey Nets for the 1981-1982 season. The following year he switched to television, calling play-by-play Chicago Bulls games on SportsVision, the team's cable-TV station. He also broadcast the CBS Radio College Game-of-the-Week. When new owners Gordon and George Gund III bought the team, Tait returned to the Cavaliers for the 1983-1984 season, and remained until his retirement in 2011. In 1987, he was named vice president of broadcast services, a job that he held until his retirement. For fifteen seasons (during the basketball off-season), Tait was also a play by play voice for the Cleveland Indians (on the radio from 1973–1979, then switching to television from 1980–1987). In 1992, he was inducted into the Radio/Television Broadcasters Hall of Fame of Ohio. From 1997 to 2003, Tait also served as the radio play-by-play voice of the Women's National Basketball Association (WNBA) Cleveland Rockers. In 2004, Tait was selected as a founding member of the Indiana Broadcasters Hall of Fame. Beginning in 2008, Tait has done play by play for the Mount Union College Purple Raiders, a Division III college football team, on regional cable-TV sports network SportsTime Ohio. He is on the school's board of trustees. He also calls high school basketball games for WEOL-AM 930. On March 26, 2008, Tait announced his 3000th game for the Cavaliers, against the New Orleans Hornets, where he sat at half court. The radio broadcast location at The Q, at section C126, has been forever renamed The Joe Tait Perch in honor of this achievement. In November 2008, Tait signed a two-year contract extension, ensuring that he would be the team's radio voice until at least the 2010-11 season. However, he has a lifetime agreement with the team to serve in some capacity. 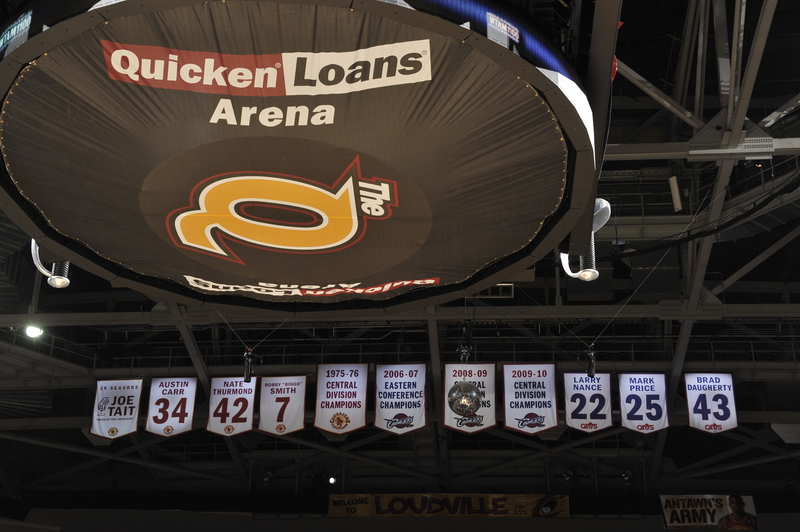 On April 8, 2011 in a game against the Chicago Bulls, the Cavaliers honored Tait by having Joe Tait Appreciation Night and by raising a "commemorative banner" with Tait's name, his years as a Cavaliers broadcaster and a microphone next to the other Cavalier retired numbers. The Cavaliers lost 93-82. Tait's final game was the April 13, 2011 contest between the Cavaliers and Washington Wizards. The Cavaliers sent Tait out as a winner, defeating Washington 100-93. As the final minute played out, Frank Sinatra's "My Way" played throughout the arena as cameras focused on his last call as a Cavalier broadcaster. In 2011 Tait co-authored his memoir, Joe Tait: It's Been a Real Ball with sports writer Terry Pluto. The book covers his early years in broadcasting, his time with covering the Cleveland Indians and his career with the Cleveland Cavaliers. "Wham with a right/left hand!" - for a Cavs slam dunk. Tait married his first wife in 1963. They were married 18 years and had three children, Christina, Karen and Joe. In 1983, he married his current wife, Jean. He and Jean reside in Lafayette Township, Medina County, Ohio. Radio announcers booth at Quicken Loans Arena renamed "The Joe Tait Perch"
↑ "Indians Broadcasters". The Cleveland Indians. Retrieved October 18, 2015. 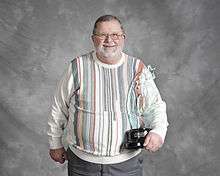 ↑ "Indiana Broadcasters Hall of Fame". Indiana Broadcasters Association. 2004. Retrieved 2009-02-25. Tait, Joe; Pluto, Terry (2011). Joe Tait: It's Been a Real Ball. Gray & Co. ISBN 978-1-59851-070-6.